Stephen M. Mindich was born in 1943, and grew up in the Bronx, New York City. He graduated from Boston University’s School of Theatre in the College of Fine Arts in 1965. 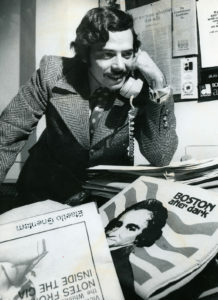 Mindich studied at the Boston University’s School of Public Communications in 1966 as a graduate student with the intention of becoming a theatre critic. He worked for WBUR-FM, a radio station licensed to Boston University, as its first arts and entertainment critic-reporter-interviewer. In 1967, Mindich started writing for Boston After Dark, a free four-page alternative newsweekly devoted to the arts. 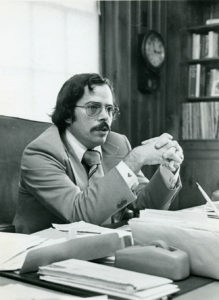 Shortly after he began working at Boston After Dark, Mindich bought a fifty percent stake in the paper. In 1972, Mindich became the sole owner. Two years later, Mindich acquired a competing paper, The Cambridge Phoenix, and merged it with Boston After Dark to form a new publication, The Boston Phoenix. The Boston Phoenix remained devoted to the arts and entertainment scene in Boston and included journalism on politics and current events. Mindich worked throughout the successive decades to expand the paper. His media company, Phoenix Media/Communications Group, established papers in other metropolitan areas including Miami, Florida; Portland, Maine; Providence, Rhode Island; and Worcester, Massachusetts. Mindich also returned to radio by acquiring the WLYN-FM signal and turning it into Boston’s alternative rock station WFNX 101.7 FM. Mindich encouraged an edgy coverage of arts, entertainment, lifestyle, and politics that was often controversial, such as the 2002 publication and hosting of pictures and a video of the execution of kidnapped Wall Street Journal reporter, Daniel Pearl. Mindich responded to changing media by redesigning The Boston Phoenix twice. In 2005, it transformed into a tabloid format, and in late 2012, it merged with Stuff Magazine and became a glossy magazine with expanded lifestyle coverage. The last printing of The Phoenix was on March 15, 2013, and the last edition was published online on March 22, 2013. In a statement, Mindich attributed the closure to radical changes in print media and advertising as well as the 2007 economic crisis. After the closure, Mindich worked to sustain The Providence Phoenix and The Portland Phoenix. However, in 2014, The Providence Phoenix closed and The Portland Phoenix was sold to Portland News Club LLC. Under Mindich The Phoenix received several awards, and he was inducted into the New England Newspaper Hall of Fame in 2016. Mindich lives in Newton, Massachusetts with his wife Maria Lopez, a former Massachusetts Trial Court judge and television jurist.